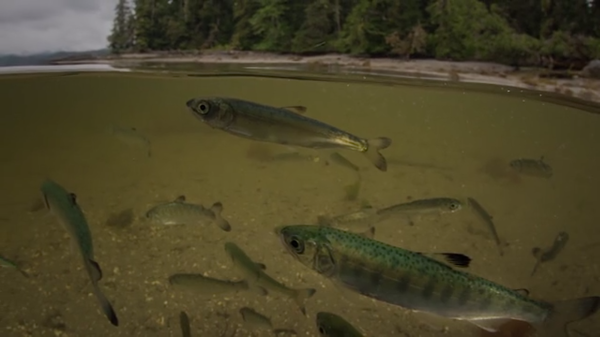 The Skeena River is the most productive salmon bearing river in British Columbia. Thousands of years before the first European colonists arrived, it was providing First Nations with food. 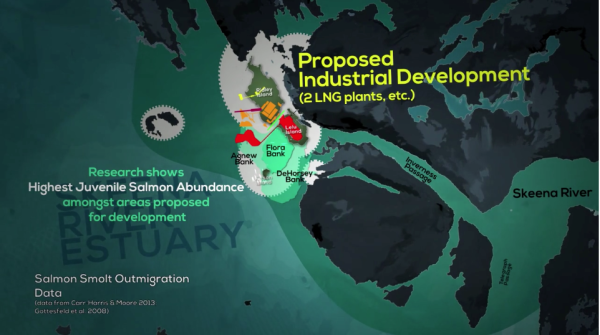 A week ago, First Nations throughout the Skeena Watershed declared their opposition to the proposed LNG project on Lelu Island, grave lack of consultation and massive damage to salmon habitat. “This is a title question, in that Aboriginal title includes the right to choose the uses to which the land is put, and the Crown has an obligation to deal honourably with First Nations regardless of whether a court has recognized their title, said Jessica Clogg, of West Coast Environmental Law. 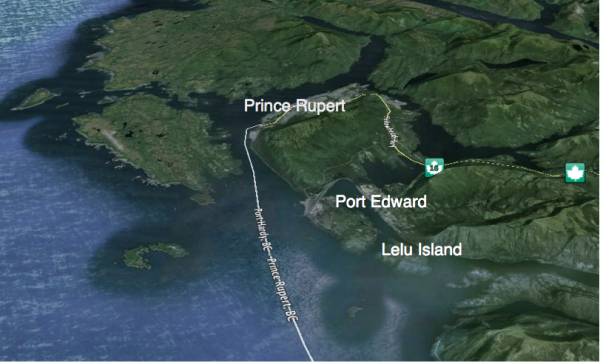 Lelu Island was to have been the first of a string of LNG facilities along the coast of BC. The developer, Petronas, referred to this project as the goose that will lay a golden egg. It was to fuel 182 LNG carriers, bound for Asia, every year. Those critical of natural gas development, and the fracking it entails, may have been surprised to learn they really do intend to build the cleanest LNG facilities in the world. 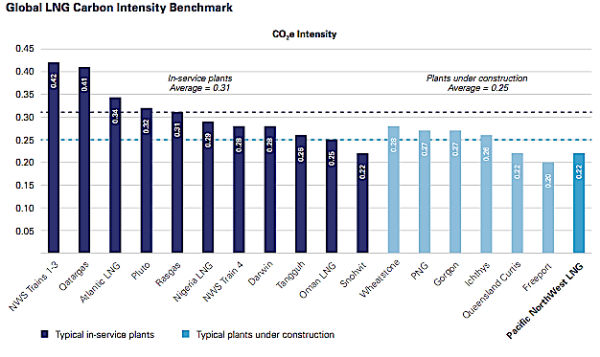 As you can see in the chart above, at a time when most LNG plants produce 0.31 tonnes of GHG per tonne of LNG, the Lelu Island facility (Pacific Northwest LNG) is being designed to produce “only’ 0.22 per tonne. This alleged “cleaness” pertains to the LNG terminals which, as Matt Horne of the Pembina Institute recently told the ECOreport, seems like a retreat from the provincial governments’ original promise that BC would have the “cleanest LNG in the World.” The fracking and pipelines, which will produce 70% of LNG’s emissions, are no longer included in this promise. The 164 ha facility on Lelu would cover 83% of the Island. It consists of a natural gas reception system, gas pretreatment, three 6.4 MTPA natural gas liquefaction trains, three full containment 180,000 m3 LNG storage tanks, a marine terminal and berths with a trestle, trestle control room, two LNG carrier berths, shipping LNG (between the terminal and Triple Island pilotage station), a materials off-loading facility (MOF), an access road, pioneer dock, bridge, and pipeline and utility connections (e.g., water and sewer). Though this project is expected to be operational by early 2019, there could be significant challenges ahead. The environmental assessments, being conducted by both provincial and federal governments, may be the least of these. Shannon McPhail, of the Skeena Watershed Conservation Coalition, said this area serves as a nursery where 90% of the Skeena’s juvenile salmon go before entering salt water. McPhail calls the proposed development both “irresponsible” and “immoral.” She also pointed me to the video “Skeena Estuary: Heart of the River,” which is now embedded at the top of this page. Pacific NorthWest LNG is proposing a combined combined suspension bridge and trestle. The suspension bridge would not require any pilings on Flora Bank and would connect to a trestle that would extend to the marine terminal. The marine terminal could be approximately 2.7 km west of Lelu Island in naturally deep water in Chatham Sound. Jessica Clogg did not agree that the government have consulted with First Nations. “Anything they do in these sensitive ecosystems needs to be vetted through our Chiefs,” said Chief Malii. “If BC thinks it can partner with foreign oil and gas companies, pick where pipelines and plants are to be sited, all the while ignoring the science that says industrial development on the Skeena Estuary is risky and foolish, and then pretend to ‘consult’ with First Nations after the fact, they have fundamentally misunderstood their legal and moral obligations to First Nations,” added Chief Na’Moks of the Wet’suwet’en Tsayu Clan. On the same note, Wilf Adam, Oputt, Chief of the Lake Babine Nation asserts, “It’s time to go beyond mouthing platitudes about new relationships and apologizing for past wrongs. The entire system of how major industrial development on our lands is proposed, and approved, is broken. It doesn’t work for anyone. It is expensive, it creates more uncertainty and most often further erodes Canada’s reputation as a civil society, or a desirable place to do business. On every level it is failing”. is the editor of the ECOreport (www.theecoreport.com), a website dedicated to exploring how our lifestyle choices and technologies affect the West Coast of North America and writes for both Clean Techncia and PlanetSave. He is a research junkie who has written hundreds of articles since he was first published in 1982. Roy lives on Cortes Island, BC, Canada.